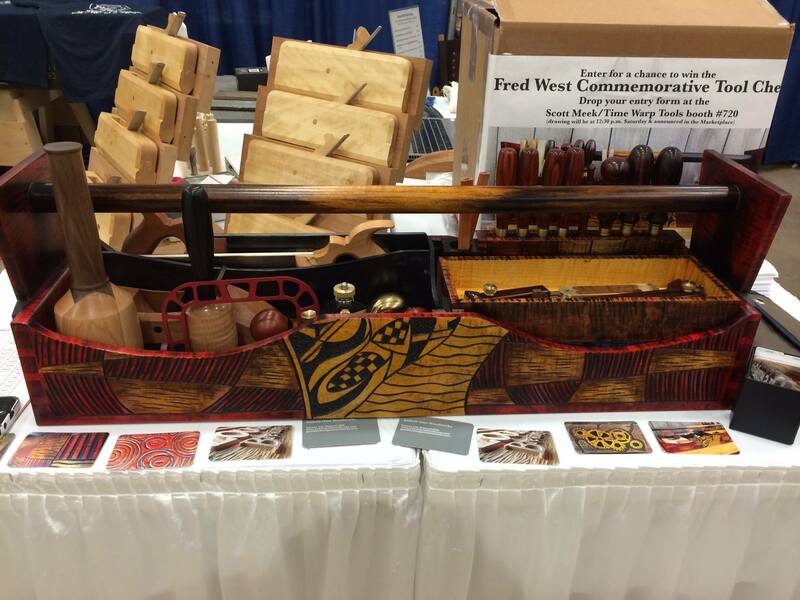 While at WIA 2014 a few weeks ago, we came across the Fred West Commemorative Tool Chest made by Andrew Gore of Andrew Gore Woodworks. We caught up with Andrew at WIA and he discussed the significance behind the chest and what was included inside of it. Below is our video, as well as a transcription for the parts that are hard to hear. My name is Andrew Gore from Andrew Gore Woodworks in Kansas City, MO. I specialize in customized work as far as tool chests and relief carving with a lot of color added to it. Back in the Spring of 2014, I was approached by Mark Harrell from Bad Axe Tool Works and Scott Meek from Scott Meek Woodworks in regards to coming up with a commemorative tool chest for a really good friend of ours, a guy named Fred West from West Chester, PA. Fred was a spokesperson for the hand tool industry. 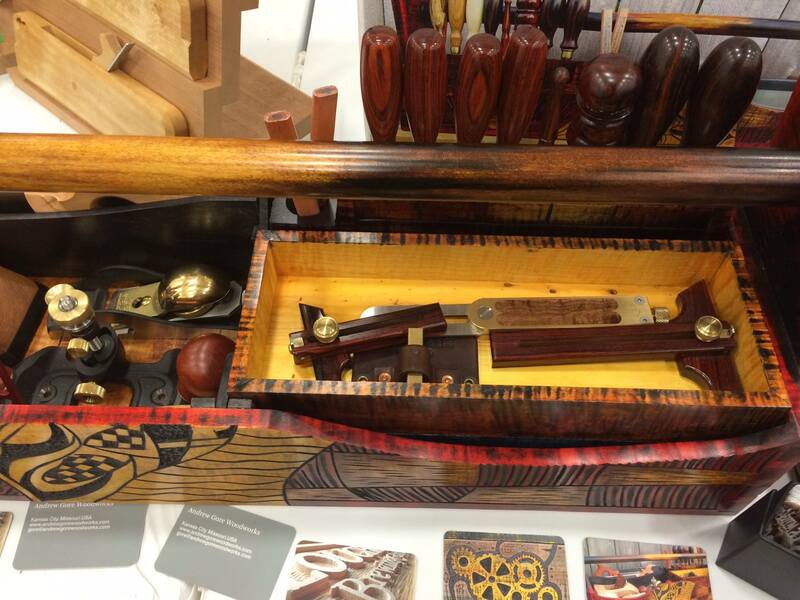 He was a supporter of hand tool makers and woodworkers like myself and he was very encouraging and inspiring for us and really pushed the level of woodwork that we do. Unfortunately, Fred had a very short battle with a rare form of cancer and passed away in January of 2014. This Spring I was approached by both Scott and Mark about coming up with a commemorative tool chest to remember this guy, that could ultimately be filled with the finest hand tools that were available. I was given a lot of free reign as far as the design and the appearance of the chest. 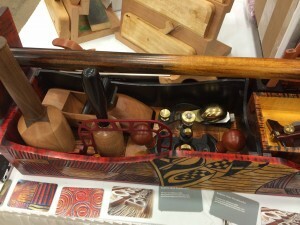 The whole idea is for it to be a museum quality tool chest; museum quality in the tool chest itself, but also museum quality in the tools that are inside of it. It needed to be an opportunity for an unsuspecting person to receive the generosity that Fred showed all of us by his giving and caring for us, his friends. 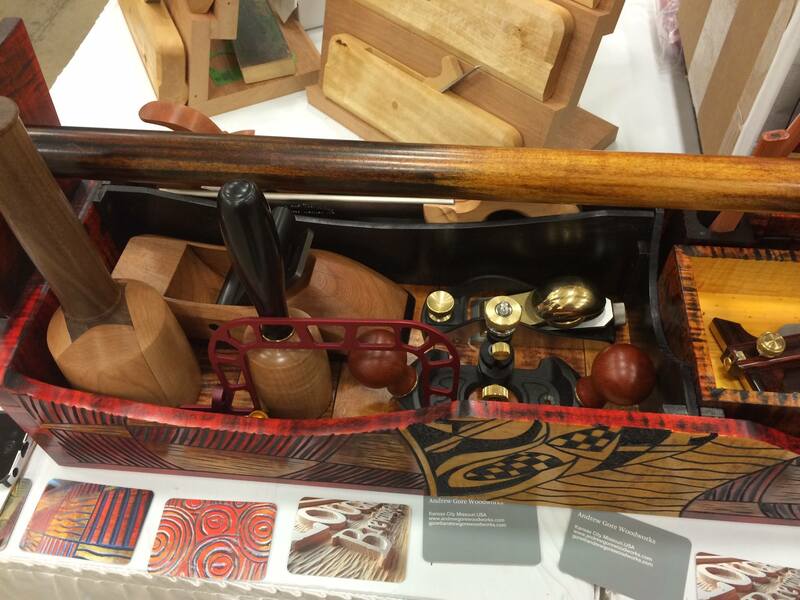 Randy Weber is a great woodturner and professional woodworker out of Lincoln, NE and was also a friend of Fred’s and he included a Randy Weber Carving Mallet. A plane adjustment hammer from Sterling Toolworks. The total value of the chest is somewhere between the $5500-6000 range and at 12:30 today (9/13/14) there will be a drawing to give it away for free as the first commemorative tool chest to an unsuspecting woodworker that was participating here at WIA.